TORONTO, September 14, 2018 – Collins Barrow National has announced the merger of three Canadian accounting firms with offices in Toronto and Vancouver. The new firm, Wolrige Mahon Collins Barrow (WMCB), comprises Collins Barrow Vancouver, Wolrige Mahon (Toronto, Vancouver) and CW Group (Toronto). According to Collins Barrow, the merger will result in a "a single, powerhouse audit, tax and specialty services firm ... [that] will further enhance Collins Barrow’s long-standing coast-to-coast presence." As reported by Canadian Accountant, Collins Barrow is expanding its presence across Canada as part of its 2020 Vision strategy, which is championed by Grant Galbraith, FCPA, FCA, the new chair of the board of directors, Collins Barrow National Cooperative. “Wolrige Mahon Collins Barrow is a fantastic addition to the Collins Barrow network and represents the latest evolution of our network as we continue to reinvent and adapt for tomorrow,” said Galbraith. In January 2018, as reported by Canadian Accountant, Wolrige Mahon LLP expanded to Ontario by launching a Toronto office led by Collins Barrow Toronto partners John Sinclair and David Kemp. The new WMCB will serve as a key pillar in the Western-Canadian mid-market, becoming one of British Columbia’s largest independently owned and operated firms. By combining their resources and expertise to offer even more comprehensive audit, accounting and advisory services, their 20 partners and 160 professionals are well positioned to adapt to the ever-changing financial climate and, most importantly, enhance client value. 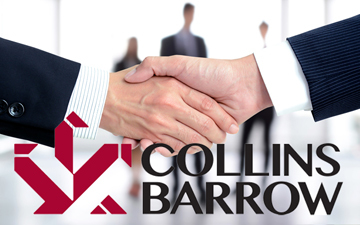 As always, while celebrating its newest member, Collins Barrow continues to actively seek firms across Canada who are ready to ‘punch above their weight class,’ join an established brand and access unique advisory offerings. By Canadian Accountant staff. With files provided by Collins Barrow National.